Ryan Zinke will step down from his post as Interior secretary, President Donald Trump announced Saturday. Ryan Zinke, a former Montana congressman, will step down as Interior Secretary by the end of the year. Zinke, a former Montana congressman and Navy SEAL, oversaw much of the Trump administration’s energy dominance agenda, including the ramp up of public lands oil and gas leasing and the rollback of environmental protections. The Interior Department includes the Bureau of Land Management and the National Park Service, which together manage 330 million acres of public lands, mostly in the West. Under Zinke, the Interior Department opened up large swaths of the West to oil and gas drilling, rolled back a suite of climate change policies, and abandoned a number of collaborative land management agreements spearheaded by the department under former President Barack Obama. Zinke announced his intention to rewrite one such plan, on sage grouse protections, early in his tenure. That reversed a deal that included oil and gas interests, environmental groups and states. The new plans, which were released earlier this month, substantially cut back habitat protections and weakened drilling restrictions. Zinke also led the administration’s push to shrink national monuments. In 2017, the Interior Department proposed slashing Bears Ears and Grand Staircase-Escalante national monuments, in southern Utah, as well as Cascade-Siskiyou National Monument in Oregon and Gold Butte National Monument in Nevada. The move was widely viewed as a capitulation to Utah’s legislators and mining interests, the result of a multi-decade fight against federal land management in the region. The Bears Ears monument, which encompassed land once held by the Navajo Nation and the Hopi Tribe and included a number of historically and culturally significant sites, was the first to include tribal nations in planning and oversight. The decision to shrink it largely excluded them and remains mired in the courts. Zinke, meanwhile, spent much of the latter half of his tenure embroiled in ethics scandals. In October, the Interior Department’s ethics watchdog referred an investigation into his involvement in a land deal near his hometown of Whitefish, Montana, to the Department of Justice, signaling he could face a criminal investigation. 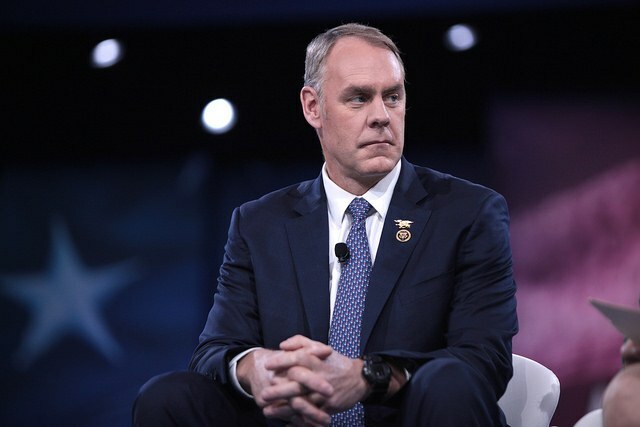 Overall, at least 17 separate investigations into Zinke’s behavior have been initiated, according to Citizens for Responsibility and Ethics in Washington, including an examination of his involvement in the erasure of climate change from department reports and retaliation against a whistleblower, Joel Clement. After Zinke joined the Interior Department, he promised to reverse the culture of harassment in the National Park Service and other Interior agencies. A survey released earlier this year found that more than 30 percent of Interior Department employees reported being harassed. And in April, the director of the Bureau of Indian Affairs, appointed under Zinke, resigned amid allegations of harassment. Until a replacement is named, Deputy Interior Secretary David Bernhardt will lead the Interior Department. Bernhardt, a longtime oil and gas lobbyist, has faced accusations of conflicts of interest related to his former employment. Under Bernhardt, the Bureau of Land Management eased approval of a pipeline in Southern California proposed by Cadiz Inc., on behalf of which Bernhardt has lobbied in the past.